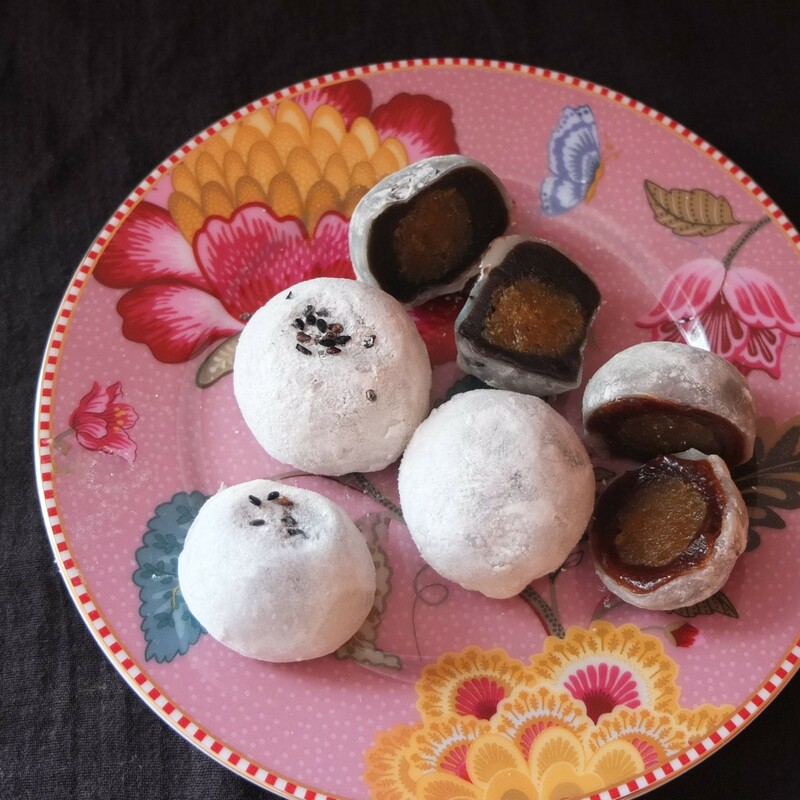 Red bean and pineapple mochi rice cakes recipe! With black sesame, strawberry or plain versions! 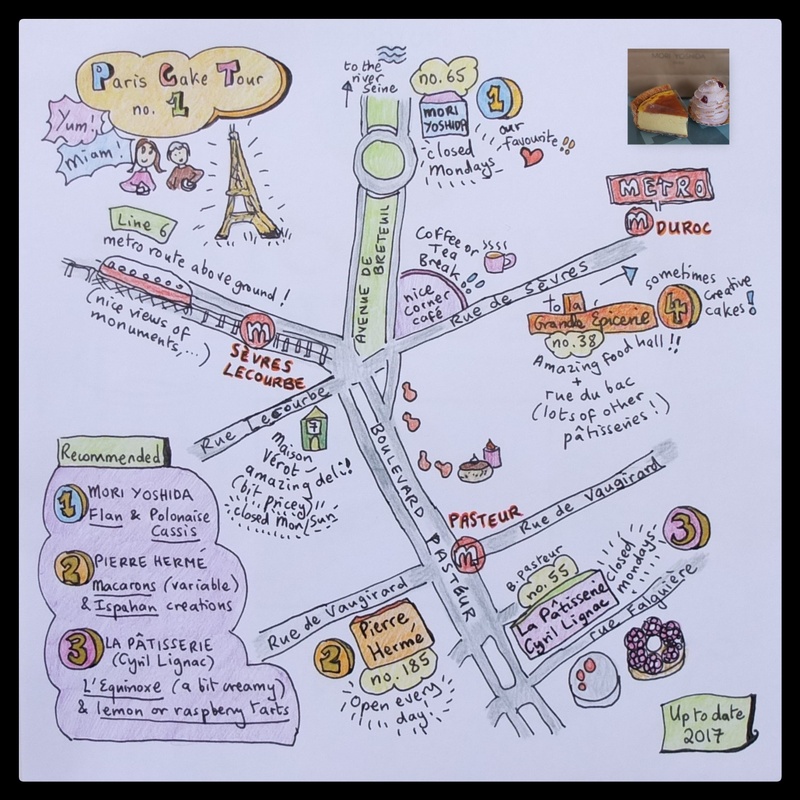 And Paris cake tour no.1! 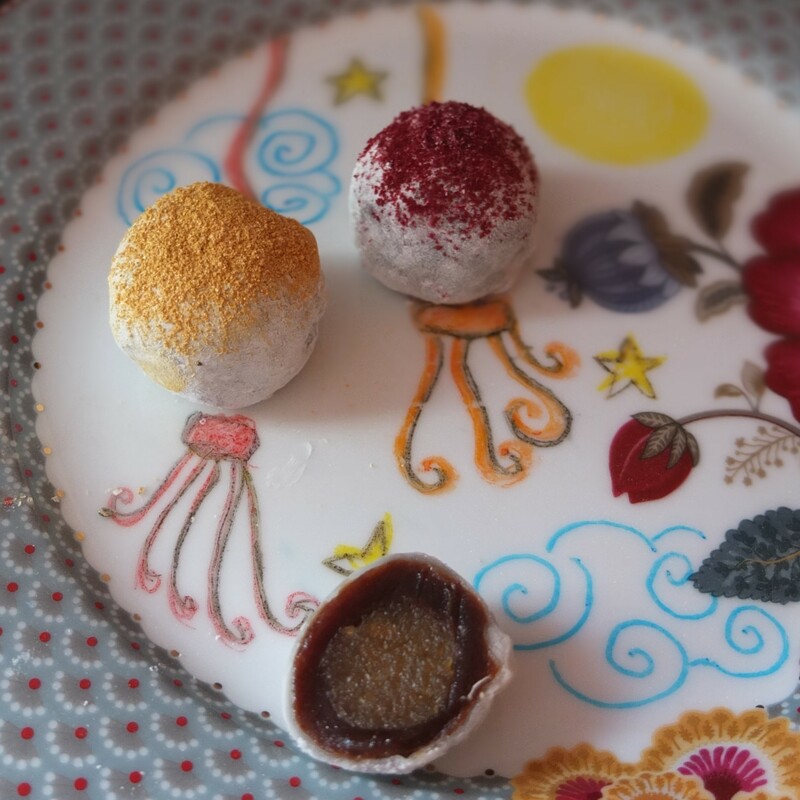 These are fusion Asian sweets based on and inspired by Chinese rice cakes, mooncakes and Japanese mochi. 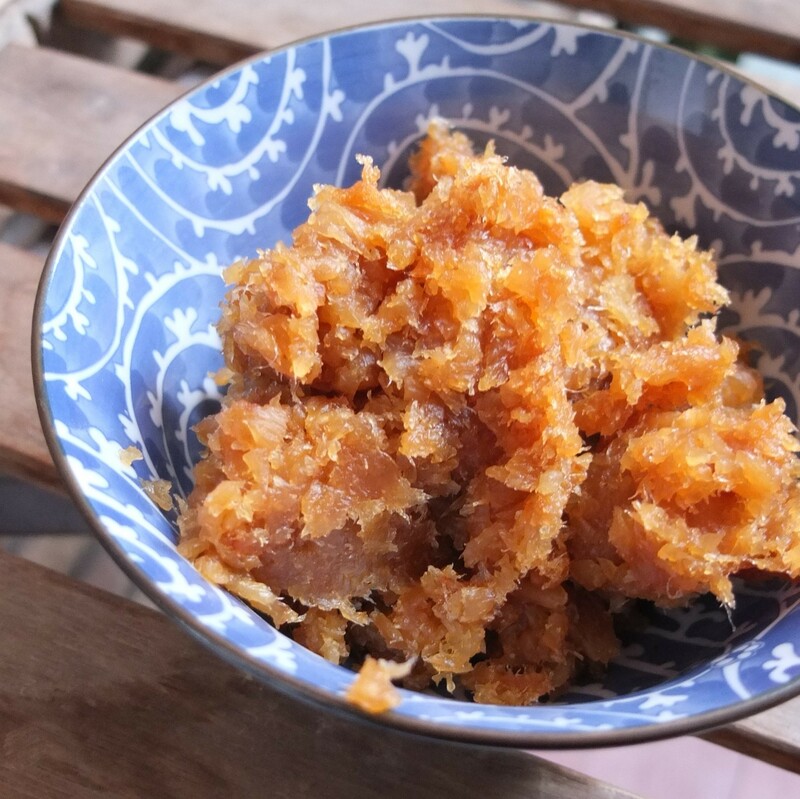 Sweetened red bean and black sesame pastes are traditionally used in Chinese and other Asian desserts and the inserts of homemade pineapple jam are a popular tart filling in Indonesia, Malaysia and Singapore. 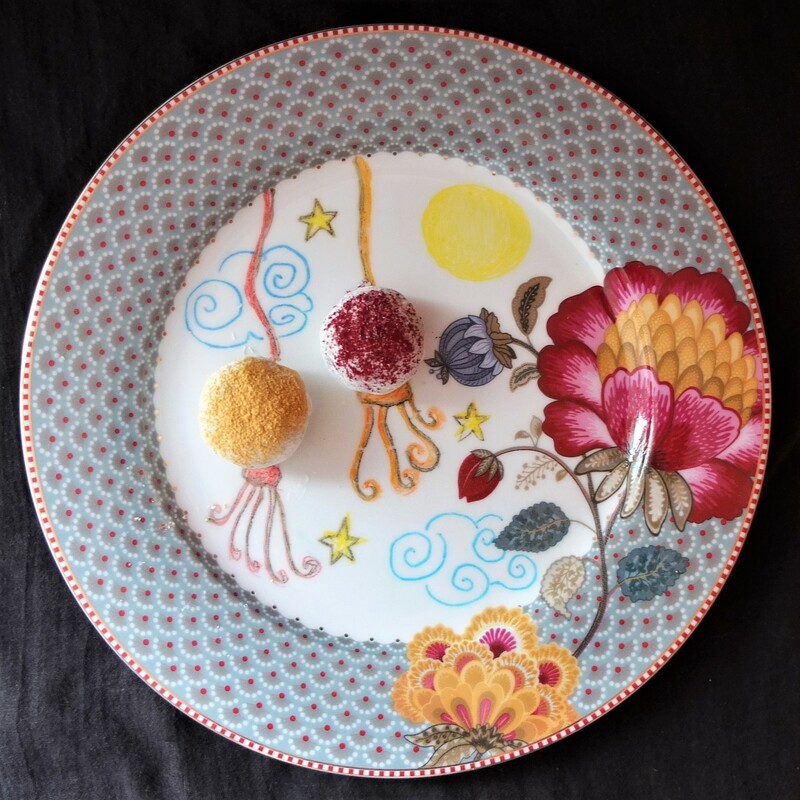 I made these for the mid-autumn festival celebrated by Chinese and Vietnamese ethnic people all over the world. It’s also known as the ‘moon festival’ or ‘mooncake festival’ because it’s when mooncakes are eaten! (see Wikipedia’s article on mooncakes here). And why a pineapple ‘moon’? Well on French TV programme Qui sera le prochain grand pâtissier? (a professional bake off) a top Chinese guest chef fully approved a competitor’s innovative use of pineapple with red bean. So I thought I’d try. Plus pineapple’s easier to find than the traditional salted eggs! And yes, the combo works! Those mochi are actually lanterns. Ahem. 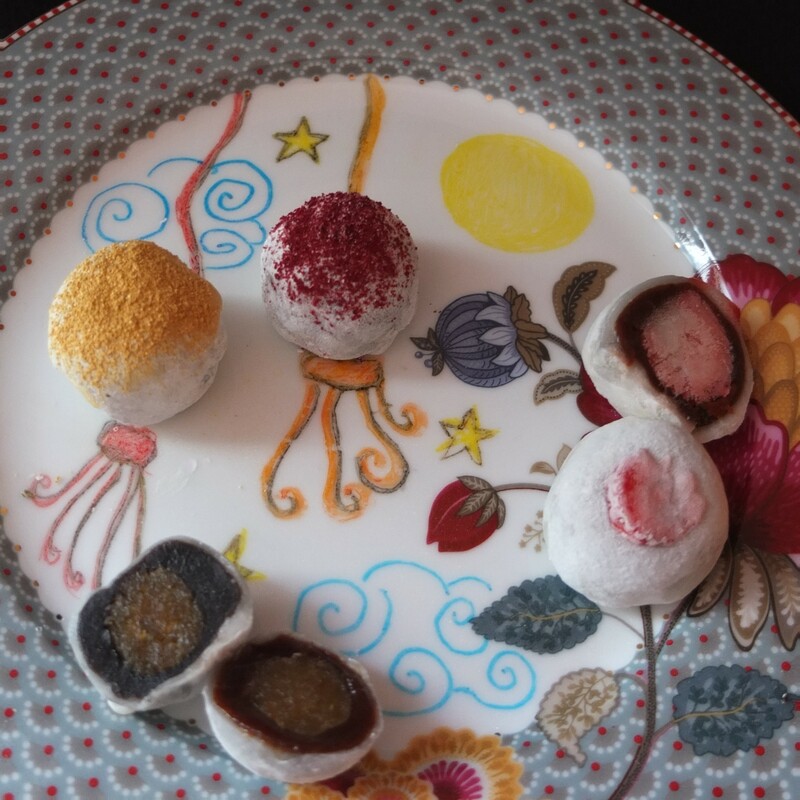 Of course you can simply fill your rice cakes with red bean paste as I did with earlier prototypes. These were rustled up in a flash while visiting mum in London. We thoroughly enjoyed them, marvelling at their deliciousness and how they stayed soft whether kept in the fridge or at room temperature. And they freeze perfectly!!! Nom nom. 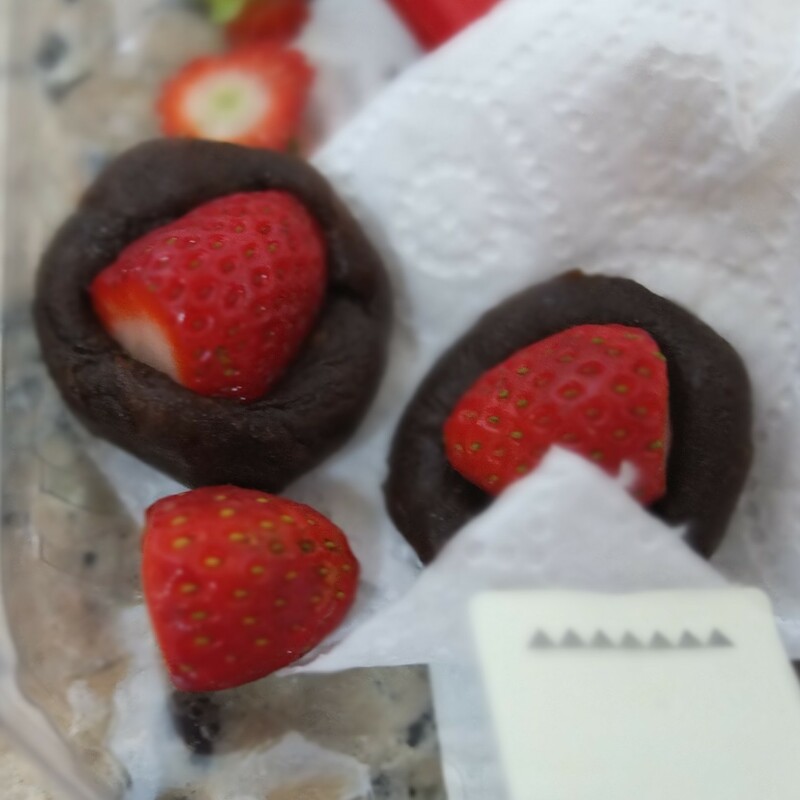 I also recommend putting a whole small strawberry in the middle – delicious and refreshing! Between the palms of your hands roll lumps of jam (6 – 7g each, approximately a slightly rounded teaspoon, to taste) to make smooth balls. Place spaced apart on a tray lined with baking paper and freeze a few hours or more. Needs to be ready for when the mochi dough finishes cooking. Between your palms roll pieces of paste (15-17g each/a slightly rounded half-tablespoon) to make around 15 to 22 smooth balls. If it’s very sticky then spoon out dollops on a baking tray lined with baking paper and freeze 30 – 60 mins or more to harden a little but not too much. This makes it easier to roll. 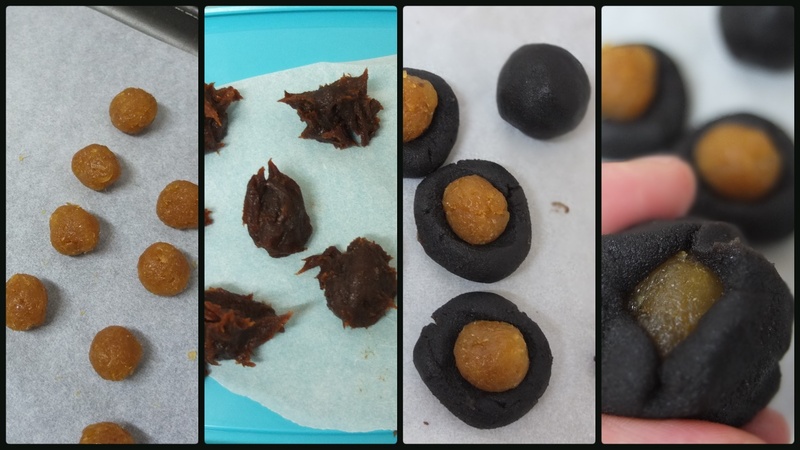 Leave plain with no insert or press a pineapple ball or strawberry into each ball of paste. Push the sides up and pinch to close at the top. Roll between your palms to make a smooth round ball again. Place all your balls again on the baking tray and freeze an hour or two. 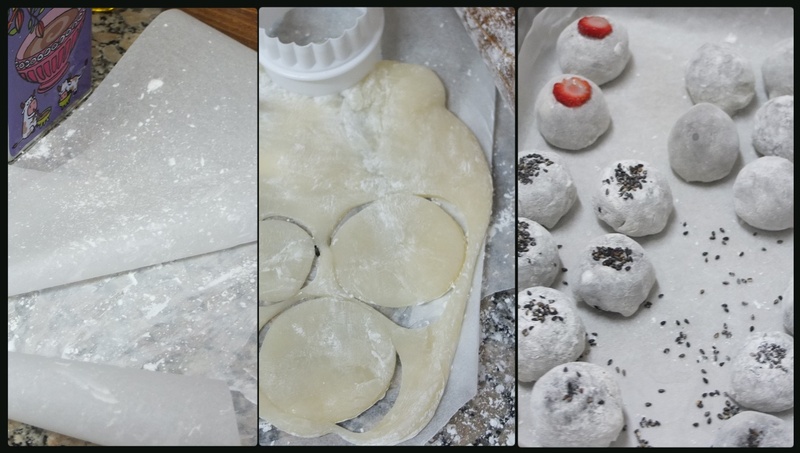 If they freeze hard they’re easier to wrap in the dough – for a rounder, neater look! Note: you need glutinous rice flour (other kinds won’t work) – found at Asian foodstores. Line a medium-sized bamboo basket or similar metal or glass container with baking paper. 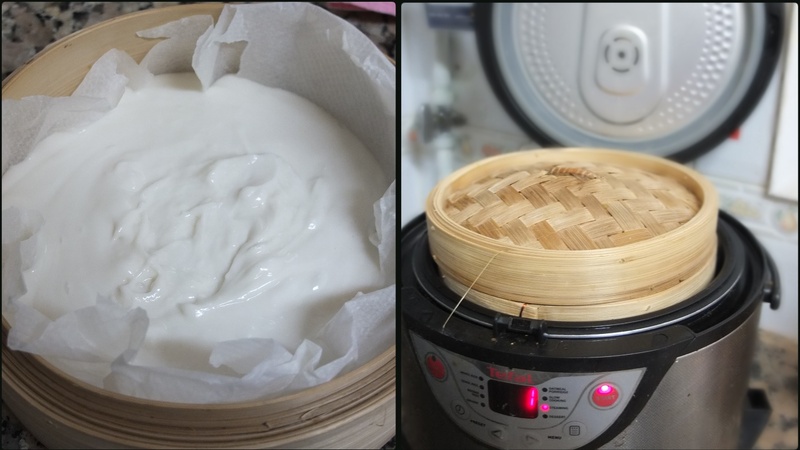 Switch on your rice cooker (on steam) or steamer. You can also use a wok or large saucepan with water in it, as long as your bowl sits on it preferably without touching the water (it can also stand over the water on a downturned metal bowl or small wire rack). Then a lid needs to cover everything, but keep it slightly open so water vapour is released. Whisk all the ingredients together in a large bowl. Place on a bain marie (1 cm/1/2 in simmering water at the bottom of the saucepan). 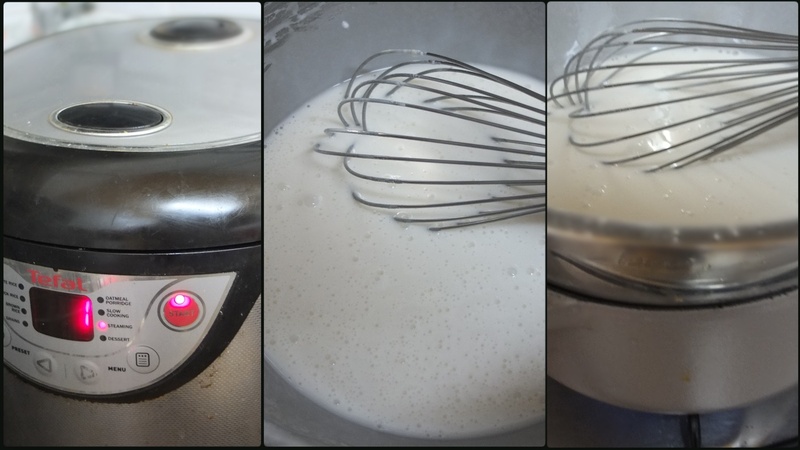 Whisk continuously between 5 and 10 minutes until the mixture thickens. 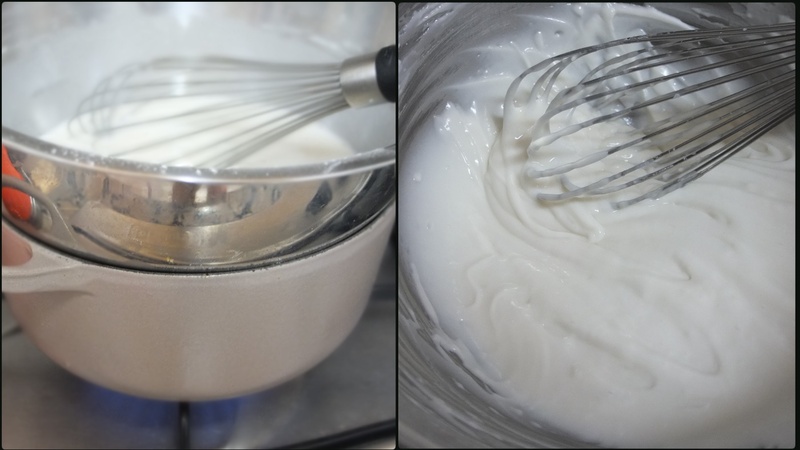 If lumps start appearing whisk really vigorously (you can do it!) and take off the heat a minute if necessary – keep whisking until smooth and thick again. Pour into your prepared recipient, cover and place to steam 40 to 50 minutes. To check if ready touch the surface lightly with the tip of your finger (be careful not to get a steam burn). If it sticks then it’s not ready yet – the mixture should be almost completely unsticky to your touch. You think it’s not getting there but suddenly…! Prepare all your bits and pieces for assembly because once it’s ready you have to work fast! Have two large sheets of baking paper on a flat work surface. 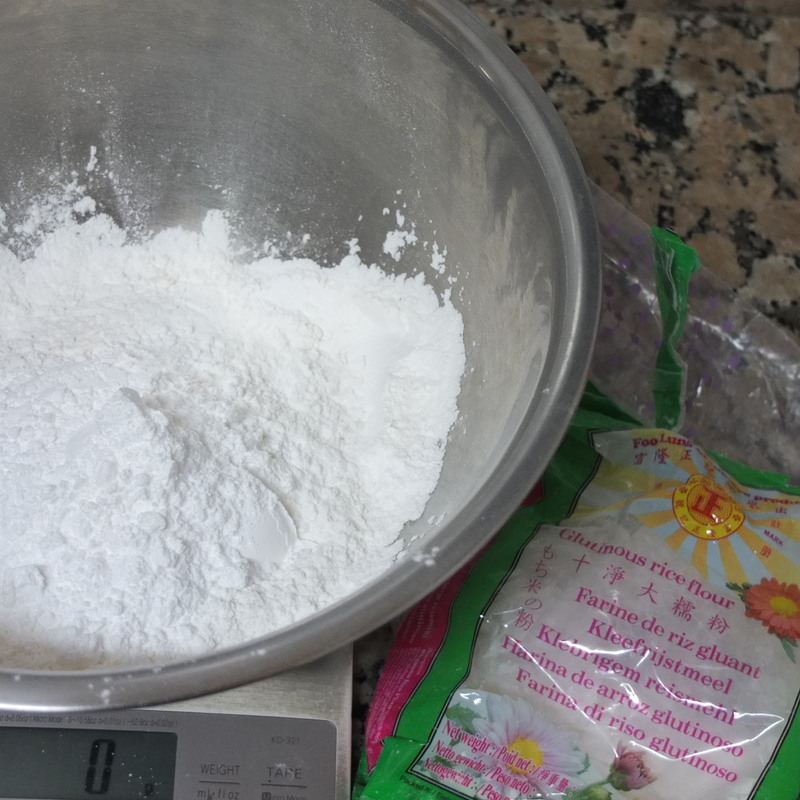 Flour lightly with cornflour. Get your rolling pin out and a cutter or glass (about 5.5-7cm diametre – the bigger rounds make for an easier but looser and thicker wrap). When the mochi skin is ready work quickly because when cold it’s harder to make it come together. Scrape the dough off the baking paper onto the clean floured sheet of baking paper. Cover with the other clean sheet and roll out until quite thin (3-4mm) and even. If things get sticky remember to sprinkle with cornflour. Cut rounds with the cutter or glass. Place mochi skin on your palm and a frozen ball of paste on top. Pull the dough up the sides and pinch at the top to close – if it’s too thin or tears you can easily add little bits of dough. Roll between the palms of your hand to make a smooth white ball. For identification purposes press down roasted black sesame seeds on top of the black sesame rice cakes and a thin strawberry slice on … yes, the strawberry ones! 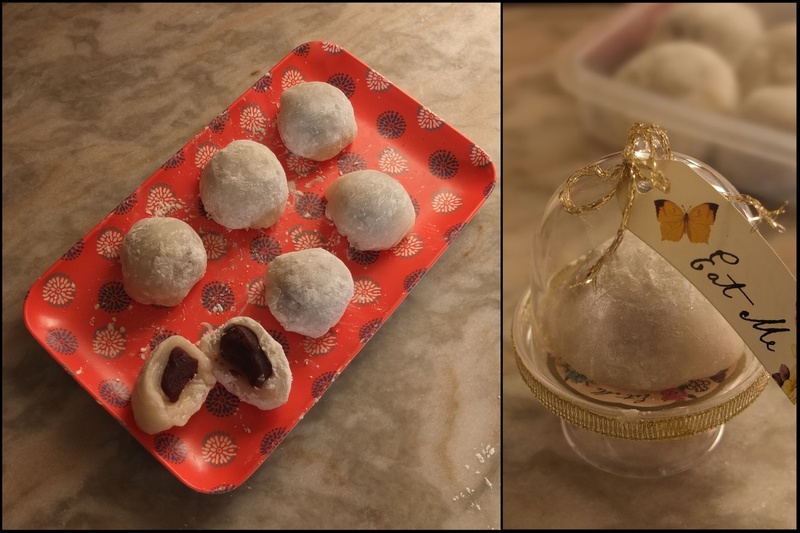 I left the red bean ones plain except for sprinkling the ‘lantern’ one with sieved beetroot powder. These little treasures keep perfectly in airtight tupperware a few days at room temperature or in the fridge and up to 1-2 months frozen. Me and mum found a batch in the freezer that we’d forgotten about and felt they were even better than before! 🙂 Defrost 30 minutes or so at room temperature. The skins will look dark but taste fine – to make more attractive roll around in cornflour so they become white again. Tip: to appreciate the ‘moon’ they’re best cut when still slightly frozen. Strange warning: having read an article recently (here) I must warn you of the fatal risks attached to eating mochi, in case you haven’t heard. Yup. So please cut up mochi if serving to children or the elderly. You should be alright eating them in moderation and with these smallish not-very-sticky ones. Just to let you know…! This festival is a kind of harvest thanksgiving. There are also stories of course and a mooncake uprising too! Read about these at Mid-Autumn Festival Legends on the China Travel Guide website or about stuff like lanterns, etc. in Wikipedia’s article: Mid-Autumn Festival. 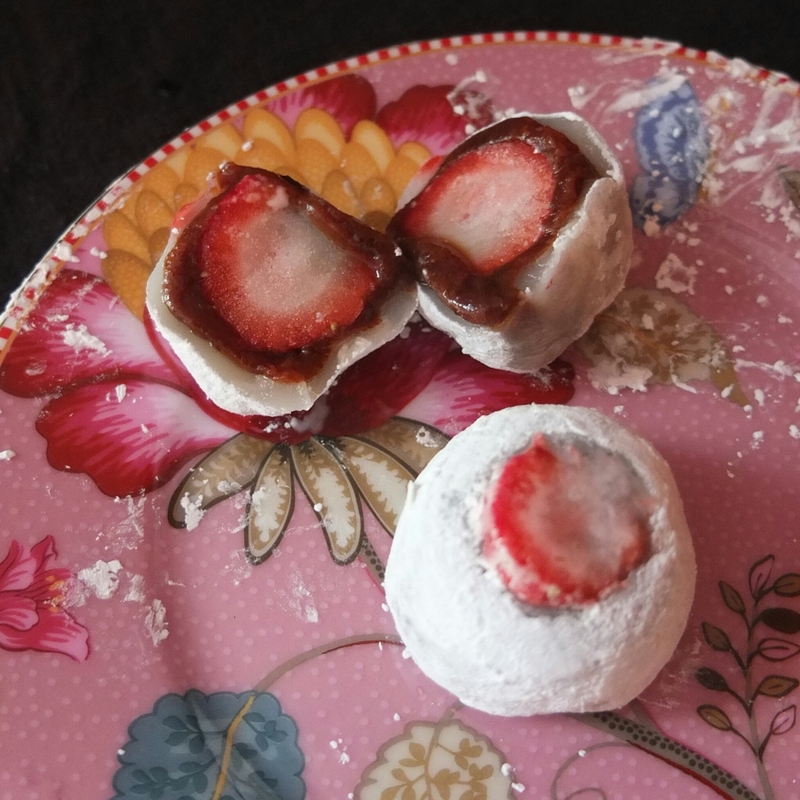 As they are rather petite I’m sharing them with Treate Petite hosted by the Baking Explorer! Do visit and see the other yummy little treats or bring food! I’d love to make the Polonaise (a soaked brioche with pastry cream, covered in soft meringue) but need to find blackcurrants (cassis) here in Barcelona. Sob. 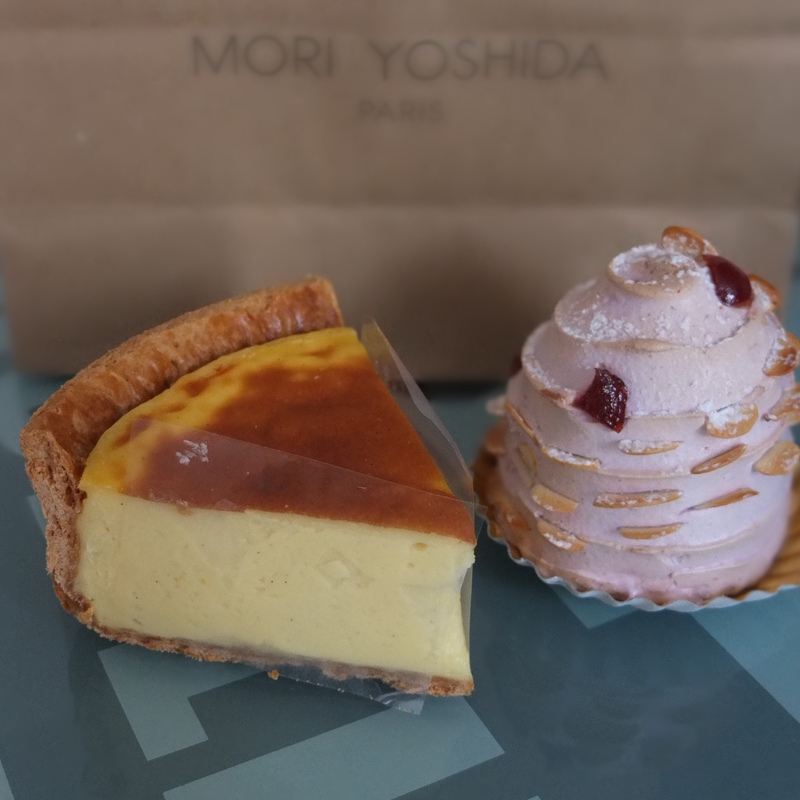 But I’ve found the recipe for Mori Yoshida’s flan so will try baking that soon! Hurray! Are you interested in making either? Yes, to being thankful for what we do have! Your Moon cakes look yummy, and beautiful. My neighbors who are originally from China brought a gift box of Moon cakes and a Piglet in rattan Monday so we could celebrate today. They are delicious, not too sweet. My neighbor’s are the best! Jung cau zit faai lok Chere Lili!! I love the map, it is tempting to go back. Would love the mooncakes too. 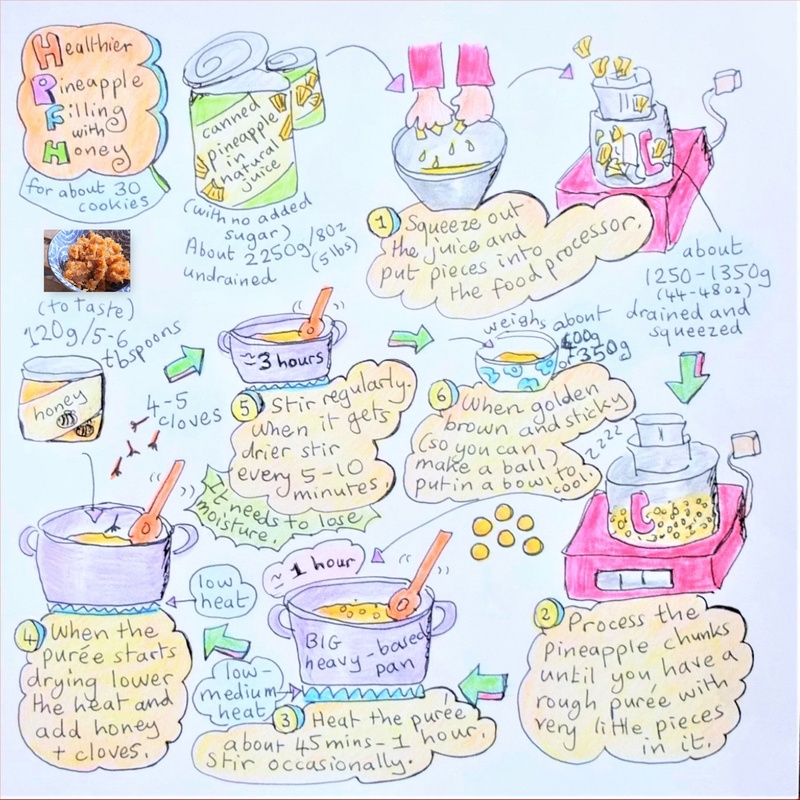 Amazing recipe & beautiful cakes ! What a delicious treat, these look incredible, thanks for sharing such a lovely recipe!